We stayed at the hotel during the Greek Easter. It was a nice, cozy and quiet hotel with great location (only 5min walk from the center of the town). The room was specious as was the bathroom and from the balcony we had a great view of the garden and pool. Although we were close to the pool and the bar there was no noise in the room. The staff was very friendly and helpful trying to make our stay as enjoyable as possible! I will definitely stay there again next time I am visiting Skopelos! Breakfast was brilliant, for everyone. Very clean room, new towels every day. The staff is very kind. The hotel is near the city center and lots of supermarket. Just returned from Skopelos, we stayed at Rigas Hotel. I would ignore bad reviews about this Hotel and just book. Nice place with openhearted people. Very clean and spacious room (talking about the Studio they accommodated us). Mediterranean gardens and a cozy tea-room. Over all Rigas was a good base, nice and small but very homely. No complaints minor things but nothing can be perfect. Great breakfast ! Great location ! Staff were lovely . Bus stop just outside so really easy to get around the island . Very helpful and friendly staff. Lovely room and location . Hotel in Skopelos town very close to and convenient for all the town’s amenities. Staff all helpful and friendly, and the rooms were generally comfortable and well air-conditioned, though the bathrooms were fairly basic. Buffet breakfast was fine, though there could have been a little more cooked choice - it did get very busy. Transport links to other local beaches were very good. To summarise, we generally had a good stay and enjoyed the beautiful Island of Skopelos very much. My husband ha s a bad back,they put a topper on our bed witch made it much more comfortable. Good breakfast,they cooked fried eggs freshly one morning,lots of fresh fruit. Lock in a great price for Hotel Rigas – rated 8 by recent guests! 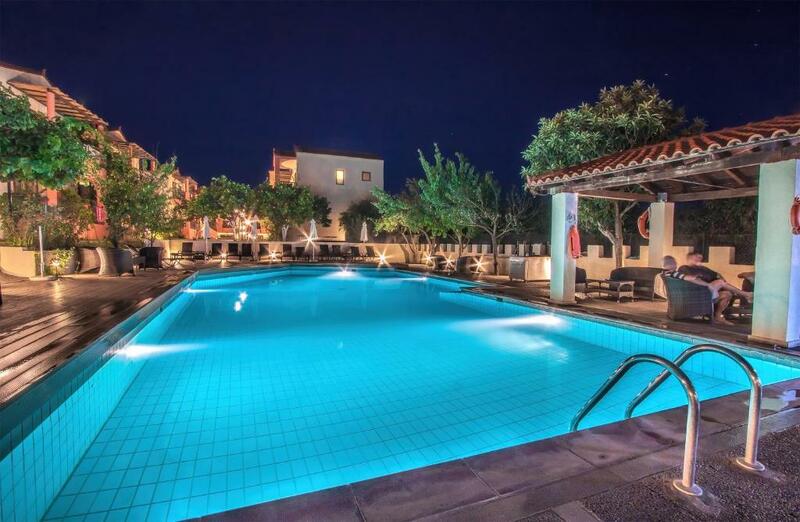 Hotel Rigas This rating is a reflection of how the property compares to the industry standard when it comes to price, facilities and services available. It's based on a self-evaluation by the property. Use this rating to help choose your stay! Surrounded by lemon trees and colorful flowers, this 3-star hotel features a 24-hour reception, a pool with sun terrace and air-conditioned rooms with satellite TV. It is just 1,300 feet from Skopelos main port. Hotel Rigas offers a variety of accommodations, including studios and apartments with kitchen facilities. Each is further equipped with fridge and free WiFi access. All units offer spacious balconies, verandas or patios with outdoor furnishings. Greek breakfast with local products, and dinner are served at the Rigas Hotel’s restaurant. Guests are offered discounted rates in all services and therapies at the Spa and Wellness Center of the sister property Skopelos Holidays Hotel & Spa. Complimentary wine and fruit basket are offered upon arrival to honeymooners and guests celebrating birthdays. Safety deposit boxes are provided for free at the 24-hour reception. Car rental and free WiFi are also available. A free shuttle service to and from the port is offered upon prior arrangement. Free public parking is provided nearby. The scenic Stafylos Beach is at 2.2 mi. 뀐 Located in the top-rated area in Skopelos Town, this property has an excellent location score of 8.6! When would you like to stay at Hotel Rigas? Providing direct access to the main entrance, this room comes with a satellite TV, a mini fridge and a bathroom with shower. Please note that a children's cot/crib cannot be accommodated in this room type. Includes a mini fridge, and a bathroom with shower or bathtub. It opens to a spacious, furnished terrace overlooking the gardens or the pool area. Please note that some units also include a kitchenette. A maximum of 4 adults or 2 adults and 2 children can be accommodated. Please see hotel policies. Includes a 2 bedrooms, a separate living area, a kitchenette and a bathroom with bathtub. Offers furnished veranda with views to the swimming pool or the garden. Up to 5 guests can be accommodated. A baby cot can be added upon request. Please see hotel policies. -free, 2-way passenger ferry tickets from Volos and Kymi ports to Skopelos OR free 2-way transfer from Skiathos Airport directly to Rigas Hotel in Skopelos (conventional boat). Children staying for free according to hotel policies are not entitled to free tickets which are only available to paying children and adults. For further details, kindly contact the property at the email address provided at your booking confirmation. These split-level apartments offer either a bathroom with spa bath on the upper floor and shower on the ground floor or bathrooms with shower on both floors. A kitchenette can be found on both levels of the accommodations. There is also a balcony with outdoor furniture. This apartment consists of 2 separate rooms. They all have a bathroom with bathtub, a fully supplied kitchenette and furniture on each veranda that overlooks the garden. Please note that only 1 extra bed can be accommodated in this room type. Divided in 2 levels, this apartment includes 2 bedrooms, a kitchenette and 2 bathrooms, one with spa bath and the other with shower cabin. It opens to spacious, furnished balconies on both levels. Featuring a small outdoor pool, this apartment has 2 air-conditioned bedrooms, 2 bathrooms with shower cabin and a kitchenette. It opens to a furnished terrace with garden views. Please note that maximum occupancy is either 5 adults or 4 adults and 2 children up to 7 years old. This apartment features a balcony, air conditioning and tile/marble floor. Is one of the pioneering hotels of Skopelos Island, built in 1978 on traditional Skopelitian architecture and fully renovated in 2006. Surrounded by lemon trees and colorful flowers, this 3-star hotel features a 24-hour reception, a lovely covered and open- air restaurant, a main - large swimming pool with spacious sun terrace and a pool bar, big gardens and open-air spaces and ironing service. Hotel Rigas offers a variety of spacious accommodations, including rooms, studios, apartments, maisonettes, suites with private pools, most with kitchen facilities. Each is further equipped with mini-fridge, A/C and satellite television. All accommodations enjoy of spacious balconies, verandas or patios with outdoor furniture for relaxing. In summer time, among the blooming and fragrant flowers, beside the soft lights of the pool, every night emerge romantic melodies. Rigas Hotel is officially certified by the Hellenic Chamber of Hotels for the “Greek Breakfast” with local tastes and recipes and serves also lunch al a carte and dinner both a la carte and buffet. Snacks and light meals are also served at the pool bar and the snack bar. Free Shuttle Bus service to/from Skopelos Town. Just 400 meters from Skopelos Town, "Rigas Hotel" is ideal for an afternoon stroll in the main port, the picturesque alleys and the traditional taverns of the island with local products. House Rules Hotel Rigas takes special requests – add in the next step! Hotel Rigas accepts these cards and reserves the right to temporarily hold an amount prior to arrival. There is a free transport service from Skopelos Port to the hotel. Guests who wish to use this service are kindly requested to inform the property at least 48 hours in advance. Please also note that guests needing extra beds or cots need to confirm with the hotel first. Please note that towels and bed linen are changed every 2nd day. Kindly note that front desk will not be available 24/7 from 10 October 2018 to 15 May 2019. Please also note that during this period, continental breakfast with traditional products will be served. Pool is open from 10:00 to 19:00. Children using the pool must be accompanied and supervised by an adult at all times. The a la carte restaurant is open daily from 11:00 to 23:00. There was nothing at all unpleasant. In fact erything was just perfect from the first moment. Didn’t have all kitchen items as on website. No hob. A kettle was provided when asked. And other items missing - not enough plates, glasses etc. Not suitable if you wanted to self cater. No pool towels available. Room was only swept once in 4 days - and no broom to sweep yourself. We booked the apartment with private pool - the first room was very dark and depressing - only a small window with no decent lighting. Breakfast wasn’t worth getting up for! Far better to pop to the bakery next door! Good location for walking into Skopelos town and harbour. Pool side seating ok. Seemed to be fairly wasp free compared to rest of island. We had a pool room . The pool is more like a plunge pool . Must say we used it only once . But apartment great to fit 4-6 and in quite part of hotel . Great room with own pool. The pool was a little small and crowded (and had lots of children jumping in which they were not supposed to do!). Appartement: Location next to a busy main road between two gas stations: noise and smell did not allow to open windows; no mosquitonet or mosquitoprotection was provided. On the other hand there wasn‘t air condition in the entire apartment so you has the choice between being biten by mosquitos/smell/noise or suffer from heat. Poor equipment in general; uncomfortable beds. Cleanness: at our arrival the apartment was dirty, after we complained a number of people came to clean it. Incident: cleaning personal changed the towels and took one of our towels which we never got back despite our complain. All in all, bad service, not the slightest effort was made to change the apartment after we complained, nor did we receive any excuse for the vanished towel. We would absolutely not recommend this hotel. It was a bit crowded at breakfast,but we should have gotten up earlier! Would have liked to be able to make a cup of tea in apartment. Was cups,plates and cutlery but no kettle or cooking facilities. Did ask but didn't get kettle but bar gave hot water which was good. Loved the area and found the staff friendly. Only ate breakfast - it had a wide choice and varied with fresh pancakes, crepes and fried egg on different days. Pool lovely, always plenty seats. Free transfer on request from port. Apartment comfortable.